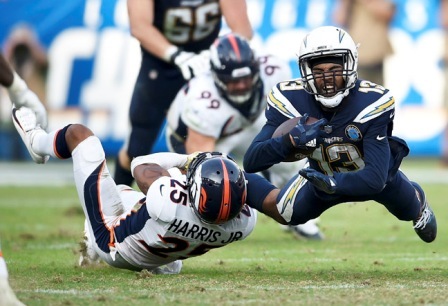 After 41 days on the road, the Los Angeles Chargers returned to StubHub Center only to fall to division opponent the Denver Broncos in the final seconds of the contest on Sunday. “Penalties. Turnovers. Not making plays at the end of the game,” Chargers’ wide receiver Keenan Allen summarized. It was an uncharacteristic day for a Chargers team that had strung together six consecutive wins coming into the game. Chargers’ quarterback Philip Rivers threw two interceptions on the day for the first time in a game since the Chargers’ 2017 season loss against the Kansas City Chiefs, in which he threw three interceptions. The Chargers also amassed 14 penalties for 120 yards in the game. The Chargers’ defense went without a sack on Broncos’ quarterback Case Keenum or an interception. In the final possession of the game, with time expiring, Broncos kicker Brandon McManus made a 34-yard field goal to give the Broncos a 23-22 edge over the Chargers. Among the mistakes made in the matchup, it was the second straight game where the Chargers’ special teams unit went for a fake punt. The following play, the Broncos scored a touchdown as rookie running back Phillip Lindsay put on the jets straight up the middle into the end zone. With 3:54 left in the third quarter Rivers threw a short pass intended for Travis Benjamin that was ­intercepted by former Super Bowl MVP Von Miller. After a 42-yard run, Miller was ultimately brought down by Benjamin at the 20-yard line. Broncos capitalized and scored to cut the Chargers deficit down 19-14. Miller has historically had more success against Rivers than any other quarterback. Denver took the lead early in the fourth quarter, 20-19, off of a Lindsay two-yard score and a failed two-point conversion attempt. Lindsay, the rookie out of Colorado, accumulated 591 yards rushing and averages 5.4 yards per rush ahead of the game against the Chargers. He finished with two touchdowns. It still came down to the wire for a Chargers team that returned All-Pro defensive end Joey Bosa. In the first quarter, Bosa earned his first tackle of the season on his second play of the game, a pass to Broncos running back Lindsay. The next play was followed by Bosa chasing Broncos quarterback Keenum out of bounds where he was forced to throw the ball away and subsequently the Broncos had to punt. Bosa participated in the Chargers' regular defensive rotation during a full week of practice leading up to the Broncos matchup. It was just ninety minutes before kickoff, that it was confirmed the Pro Bowler was officially designated as active. Bosa missed the first nine games of the season after suffering a bone bruise in his left foot during a practice in early August. He then re-aggravated the injury in early September. Last season, Bosa notched 12.5 sacks and made 70 total tackles with four forced fumbles. In his season debut, Bosa ended up playing 31 defensive snaps for the Chargers far more than he anticipated. “I felt pretty damn good,” Bosa said. “My conditioning … I was scared to get more than 15 [snaps] for my conditioning alone. Anybody will tell you playing football and running drills isn’t the same thing. It was also more than Lynn game planned. Bosa was “knocking the rust off” as he described it, which was to be expected after having such a significant amount of time away from the football field. With the loss to the Broncos, the Chargers are 7-3 on the season. The Chargers will have a chance to rebound as the team hosts the Arizona Cardinals on Sunday, Nov. 25 at StubHub Center.